Magma Structures is providing structural design and engineering expertise for the Lady A motor yacht. Portsmouth, UK based Magma Structures said that it is providing ‘composite expertise’ to a refit of a superyacht owned by British businessman Lord Sugar. 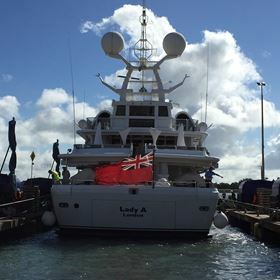 Magma Structures is providing structural design and engineering expertise to enable the installation of larger stabilizers to the custom built 55 m motor yacht, named Lady A. In addition, Magma Structures’ team of composite design engineers and manufacturers are assisting with modifications to the stern gear and rudders of the glass fiber reinforced plastic motoryacht. The company is also assisting with the lightweight composites that are being used to reinforce the deck cranes, which are used for the launch and recovery of the yacht’s tenders. This is one of a number of recent projects in which Magma Structures are supporting the modification, design and manufacture of composite parts for superyacht refits, the company says. This story uses material from Magma Structures, with editorial changes made by Materials Today. The views expressed in this article do not necessarily represent those of Elsevier. Wytchcraft Composites, a manufacturer of glass reinforced plastic tooling and moldings, has moved into larger waterside premises.